If you’ve spent any time on social media over the past few years, you’ve probably noticed that at least half of it is now given over to adorable pictures and videos of cats and dogs. You won’t find us complaining! Pets are adorable and entertaining – and they can provide real benefits to many people, especially seniors living at home. What Are the Benefits of Pet Ownership for Seniors? Caring for an animal provides structure and routine, which can be a great benefit to many people as they age in place. Having daily goals and activities is a great way to stay mentally sharp. At the same time, having an animal – whether a dog, a cat, or something smaller, like a bird or guinea pig – encourages movement, from setting out meals for your pet, to taking the dog out for a walk, to playing fetch or other games. In addition to providing companionship, having a pet can also provide protection and security. For example, a barking dog can be a great deterrent to would-be intruders. 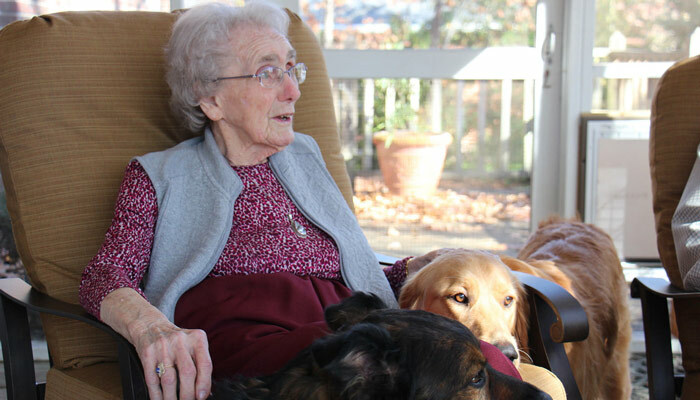 Plus, trained service and therapy animals can help with an older person’s daily wellbeing. Some animals may even be trained to help with daily activities, or react and get help in the event of an emergency. Is Owning a Pet Right for Everyone? Owning a pet may have some major health and lifestyle benefits for seniors – but it’s also not without its risks. Having a pet around the house just isn’t the right fit for everybody, and it’s important to keep that in mind. For instance, having a pet could come with some health risks. Managing an animal could lead to an increased risk of falls, or catching an illness – this is especially true for older adults with compromised immune systems. As Aging in Place points out, more than 86,000 people per year have to go to the emergency room because of incidents involving their dogs and cats. Finally, bear in mind that caring for a pet properly is a financial commitment. From birds to canines, animals need food, shelter, vet appointments, toys and accessories, grooming care, and more. It can be expensive to own a pet, especially over time. One way to help prevent some of the downsides of pet ownership for older people? Make sure your senior isn’t going it alone! This could mean stepping up as a family caregiver, hiring animal specific help (such as a dog-walking service), or bringing in a professional companion service to assist your loved one. A professional caregiver can come in and check on things, help take care of housekeeping for seniors and their pets, assist with walks, running errands, and more. Above all, a companion will be able to make sure that senior and pet are both doing all right.They can keep their eyes open for warning signs of trouble, and let you know if caring for a pet seems to be too much work for your loved one. How Do You Find the Right Pet for Your Senior? Dogs can be a challenge, as they usually require a lot of exercise and play. Will your senior be able to keep up without help? For those with mobility or movement issues, you may want to consider lower impact animals, like cats or birds. Will a certain type of animal, or breed, be the right fit personality-wise? For example, high energy dog breeds may not be a great fit for a more laidback or slow moving senior. Before committing to an animal, research different breeds, and the personality characteristics of different types of animals. As you meet new potential pets, get to know each animal’s personality before bringing it home. Has your senior owned a pet before, or are they a novice? How many animals can they realistically handle? Are they up to training or house-breaking a new pet, or do they need a furry friend who has already been trained? These are all important questions to consider. You don’t want your loved one biting off more than they can chew. How Can You Help Your Loved One Live Independently? Having a pet may be one way to help someone you care about age in place independently, but it’s important to weigh whether it’s the right option for your loved one. If you have any questions about caring for the older adult in your life, don’t hesitate to reach out to Companions for Seniors! We’d be happy to be your sounding board, share our experiences, and talk over any questions or concerns you may have about any aspect of caregiving for your aging loved ones. If you have a loved one that you believe could benefit from the assistance of a professional caregiver, please don’t hesitate to reach out to one of the professionals at Companions for Seniors. Our companions are trained, bonded insured, and can help your family shoulder some of the burden of caring for an aging loved one. We help provide seniors with a higher quality of life, while also offering respite and peace of mind for a family caregiver who might need some support. Our companions help stimulate our clients physically, mentally, emotionally, and spiritually, empowering them to live an active and enriched lifestyle. Have any questions about Companions for Seniors? Want to get in touch? Don’t hesitate to give us a call, or fill out our contact form available here.